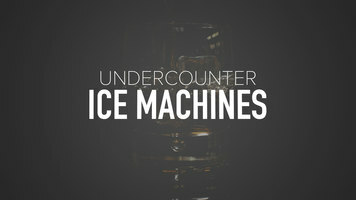 If you need a reliable unit, the Scotsman Essential line of undercounter ice machines are a great choice. See all the different, exclusive technology they have to make each unit a reliable machine in your business. Scotsman CU0415MA-1 15" Air Cooled Undercounter Medium Cube Ice Machine - 58 lb. Scotsman CU0515GA-1 15" Air Cooled Undercounter Full Size Cube Ice Machine - 84 lb. Scotsman CU0715MA-1 15" Air Cooled Undercounter Medium Cube Ice Machine - 80 lb. Scotsman UF424A-1 24" Air Cooled Undercounter Flake Ice Machine - 440 lb. Scotsman UF424W-1 24" Water Cooled Undercounter Flake Ice Machine - 440 lb. Scotsman UN324A-1 24" Air Cooled Undercounter Nugget Ice Machine - 340 lb. Scotsman UN324W-1 24" Water Cooled Undercounter Nugget Ice Machine - 340 lb. 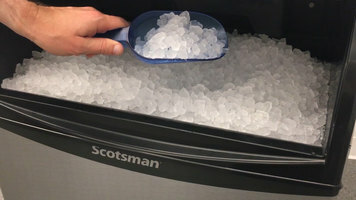 A guide to the features and benefits of the Essential line of Scotsman Ice Machines. The perfect fit for smaller operations, this Scotsman ice machine boasts a high capacity without taking up too much room in your facility. 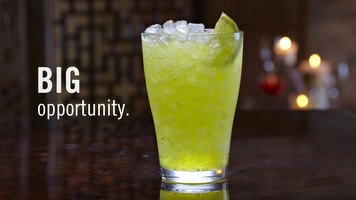 Find out all the benefits you can have by adding this ice machine to your business!